Ifesinachi Industries Nigeria Limited is a Private Limited Liability company with major interests in Transportation, Petroleum Marketing, and Vegetable Oil Manufacturing. The Company was founded in 1972 by HRM IGWE James Ogbonna Mamah and was incorporated on 4th February 1981 as a Private Limited Liability company. Ifesinachi Industries Nigeria limited is a leader in the Transport Sector in Nigeria with over 30 years of road transport operations and management experience. The Company a member of Association of luxury Bus Owners of Nigeria (ALBON). Check in closes 1 hour before the estimated time of departure. Departure time will not be extended for customers who arrive late. We recommend that you honor this check in deadline to ensure timely departure. Customers are entitled to one medium sized luggage (30”x22”x15") per ticket for comfort and safety purposes. Please note that we will not be able to accommodate any luggage with dimensions exceeding our requirements . In cases where luggage is in excess, Customers would either need to send the excess luggage via our sister company Ifexexpress Logistics or purchase an extra seat to cater for this. Ifesinachi Transport has no refund policy. Tickets can be carried over to be utilized at a future date with validity restricted to within one month of ticket purchase. Kindly send a mail to help@ifesinchitransportng.com with the new itinerary before the travel date. Prices are subject to change without prior notice to customers due to unforeseen economic circumstances. (1)The Child fare rate only applies to children between the ages of 2-10. (2)Children within this age band cannot travel without being accompanied by an adult. (3) Child fare rate can only be enjoyed upon tendering a photocopy of a valid means of identification for child(ren) on planned day of travel. (4) Ifesinachi Transport will not accept reservations or provide transportation for unaccompanied children below the age of 16 for any itinerary. Failure to do this implies cancelation of discount given. An adult is only allowed a maximum of three child fare rates per booking. 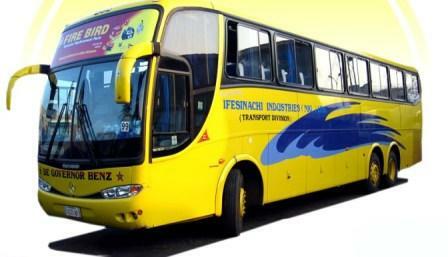 Ifesinachi try best to maintain our stated departure times. However, we are at liberty to change the scheduled time of departure should we be faced with circumstances beyond our immediate control. In the event that this happens, we will inform you of the new departure time immediately.